Since 1801, pie charts having been displaying information and statistics about everything from population to profit, market share to margins and, presumably, the most popular pastry-encased dinners. Pie charts are as popular in the statistics world as their namesakes are in the culinary world – but there are some convincing reasons to avoid using them altogether. Basically… pie charts are bad. But tell someone that pie charts are rubbish and they’ll look at you with a mixture of confusion, surprise, and even anger. Humour them though, because even I reacted this way when I was told the same information. Be patient, remain impartial and explain the following important arguments against the use of evil pie charts. So what is wrong with this pie chart. While it is reasonably clear that the Conservative Party got the single biggest chunk of the vote, it is really hard to tell the difference between the next three parties, UKIP, Labour and the Liberal Democrats. This is a bit of a problem as this is the whole point of the chart – to give us this kind of information. It is also quite hard to tell the difference between the next two parties, Green and BNP. The reason that this pie chart business is such madness is that all of this information is really easy to understand if you just put it into a column chart. Look at this chart, which shows exactly the same numbers – don’t you think it is easier to compare the difference between the share of the vote – even where the values are rather close? The difference is clear. 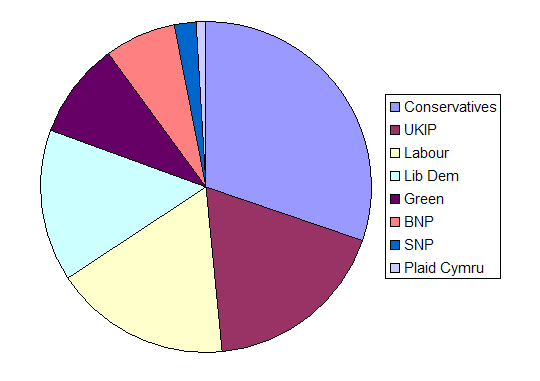 When comparing the portion of the total vote, the pie chart (which is the guaranteed choice of the newspapers) is rubbish when compared to the column chart. To keep the comparison between these as fair as possible, I have very carefully kept the height of the tallest bar the same length as the height of the pie chart. But this brings me to my next argument. Using exactly the same statistical reference as the previous example, let’s get to size. No matter what anyone tells you, size does matter. So what happens when we change the size of our graphical statistical tools. Pie charts once again demonstrate a problem. When you make a pie chart bigger, nothing happens. A larger chart doesn’t reveal more information. It is just as useless as it was when it was tiny. Just look at this, what a waste of space. Our feisty column chart, however, remains versatile. Enlarging the chart can make the differences between the items even clearer. In these examples, you can see the differences clearly enough in the small chart, but you can also see the enhanced impact of the big one beneath it. 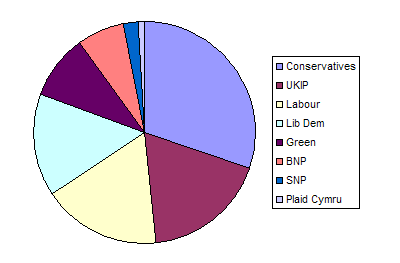 In 2010, the people of the UK voted in the General Election. 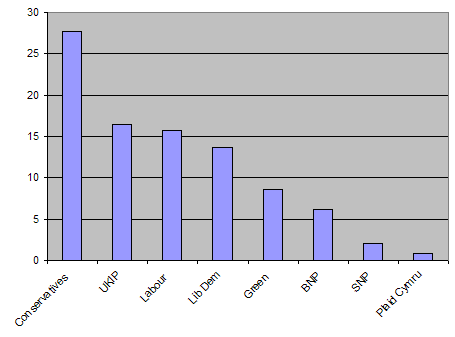 The result of the election was a hung parliament, which essentially meant that no single party had an overall majority. In this scenario, the two parties with the most votes look to the smaller parties to support them in order to have a combined majority. The long and short of this electoral scenario is that you need to do a few sums. 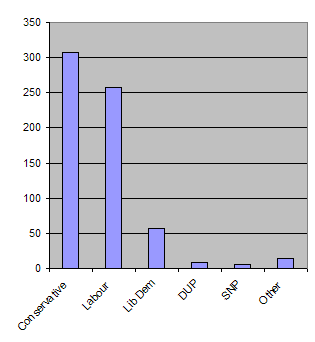 The top two parties were the Conservative Party and the Labour Party. In third place were the Liberal Democrats. So here are the important questions that come up when this happens. Erm. It is actually quite hard to tell isn’t it. 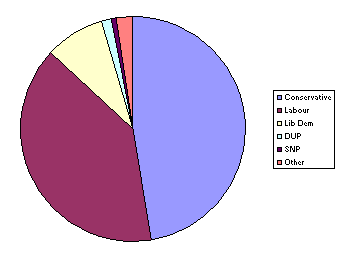 The lilac section verses the combined purple and yellow section – it isn’t very easy to tell which is bigger when it is displayed on a pie chart. If we return to our trusty column chart though, things are a little more obvious. Quite clearly, the Liberal Democrats were in a uniquely gifted situation. If they were to team up with Labour, the combined party would be bigger than the Conservative Party. Equally, if they teamed up with the Conservatives, they would be the outright winners. 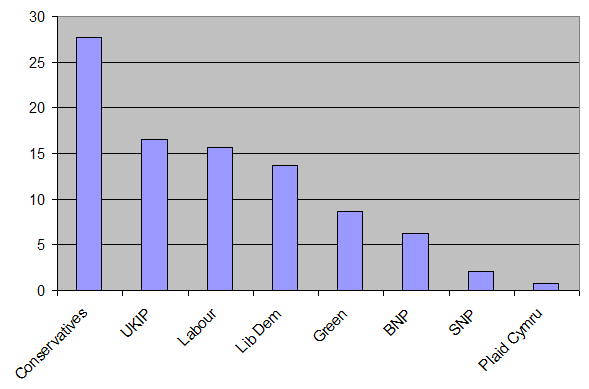 The Lib Dems were the king-makers of the general election. And the kings of the chart world, well – suffice to say it isn’t the pie chart. There are many, many reasons to despise pie charts. I have kept the arguments small in number in order to spend the time fully illustrating them. I haven’t gone into arguments such as the ridiculously unintelligible polar pie charts, stupidly complex spie charts, multi-level pie charts, donut charts or any other variation. Suffice to say, they don’t work in their simplest form – so making them more complicated does nothing to improve things. Although I have clearly made no effort to be impartial about the hateful pie chart, but I have been very careful to ensure the following rules have been strictly adhered to in this article. I have used real statistics in these charts. I haven’t invented statistics to deliberately make pie charts look bad. In fact, the statistics that make pie charts look the worst are 6 very similar values. If I had used the 6 very similar value trick, I could have made pie charts look even worse – but I didn’t need to because even with real numbers they are terrible. I haven’t used anything funky. Making charts look 3D is all the rage these days, and making a pie chart 3D makes it even worse than it already is. I didn’t want to kick it while it was down, so I haven’t used any effects on any charts. Column charts look good with a 3D effect – and remain readable too. I have ordered all pie and column charts highest-to-lowest. This is how people expect charts to be ordered and that’s how I’ve ordered them. Again, pie charts get really messy if you don’t order them highest-to-lowest – but I haven’t used this nasty trick to discredit them further. By sticking to these rules, I can say with all sincerity that I never wish to use a pie chart to illustrate numbers again. They just aren’t up to the job and the very use of a pie chart is editorial patronisation. If you think that the consumers of information are too stupid to read a proper graph or that column charts are too boring – you need to have a word with yourself! Pie charts do not perform the function of a chart – so from now on let’s call them what they are. Pie deception devices. Remember, the reason you are displaying information in a chart or graph is that you want to make it easier to interpret and compare information. Pie charts do quite the reverse. So the next time somebody asks you “are pie charts good”, tell them instantly – “no, pie charts are bad”.